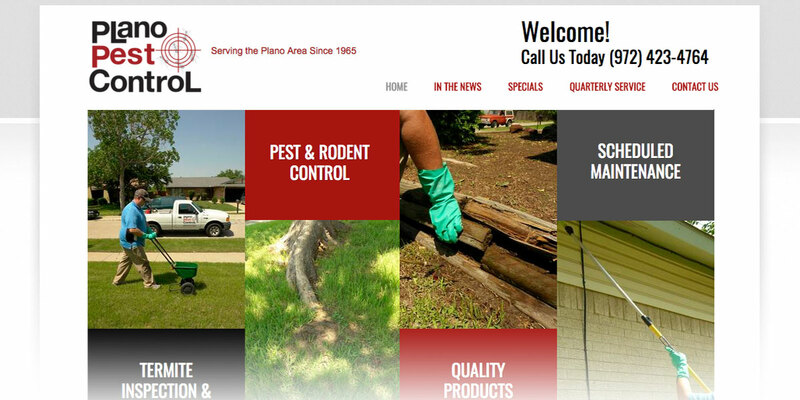 Serving the Plano area (Texas) since 1965, Plano Pest Control provides pest control services, to include termite inspections, flea and tick control, etc. The business has been growing for a several years now and they needed assistance with website and marketing solutions to be able to further the progress of the organization. LiquidFly then became a reliable partner initiating effective brand building steps through marketing and web solutions. Specifically, we have created a set of new images and company signs that are printed on business cards, car wrappings, and decals. As a result, people easily recognize Plano Pest Control’s brand in the running when they look for similar services, thus lending a competitive edge to the company. Due to the professionally developed marketing collateral, the company received more recognition, which elevated the brand even higher. LiquidFly has also made significant updates to Plan Pest Control website by integrating forms for quote request, general contact and sign-up for maintenance option, making the site more user-friendly. Because of the fruitful collaboration between the companies, Plano Pest Control is now well equipped for further growth and development. We Have been using LiquidFly Designs for several years and I’m more than happy. If you need web site, logo & brand management, media, advertising they are your guys! LiquidFly Designs was born from a fiery desire to create media reflective in vision of both the designer and the client. Viewing this as a collaborative endeavor creates a unique mindset at LiquidFly which is tuned toward making visions into reality. Many factors come into play, the most significant of these is having experienced creative people listening carefully to your ideas and translating them into the media of your vision.